Deborah Sweeney and her company “MyCorporation” want to make it easy and inexpensive for small business owners to set up their business entity and maintain their ongoing legal requirements. The concept is for you to use their services to prepare all your documents and file them as required, when required. It’s true that using MyCorporation is much cheaper than using an attorney. But is Sweeney’s firm for you? It’s great to save money. But do those savings increase the risk of getting something wrong or overlooking some important small detail? I’ll give you my own opinion in a minute. For now, let’s take a tour of MyCorporation and then we’ll determine if and how to use their services. In preparation for this review I spent a couple hours going through their site with a fine tooth comb. Then I got on the phone with Deborah who is the CEO of the company. Here’s what I discovered. MyCorporation was started in the late 90’s by team of attornies. The company was acquired by Intuit (of Quicken and Quickbooks fame) in 2004 and Deborah Sweeney ran the division. Then in 2009, Sweeney bought the company from Intuit and took it private. I found this interesting and important. Unlike the other major players in the online legal document preparation business, these guys really “get” the small entrepreneur. Why? Because that’s the mentality of the CEO and owner and it definitely trickles down. The company is into building relationships rather than transactions as you’ll see shortly. When I asked Deborah for an interview she immediately jumped at the chance. And once we started talking I just knew she was completely excited to be in the business she is in. How many attorneys or CEOs do you know who are thrilled by their occupation? Not many. I was talking to an entrepreneur and I knew it. It was a good start. Let’s take a look at their site and see if the magic is there too. What Kinds Of Businesses Can MyCorporation Help You With? When you come to MyCorporation’s home page there are two tabs on the navigation bar that are really important. They are the “Start My Business” and “Run My Business” tabs. The “Start My Business” tab has a wide selection of choices. They can do the paperwork for just about any business you want to start. The menu is impressive. And if you know what kind of business entity you want to form, this is great. You can get going right from the home page. But I was still puzzled. 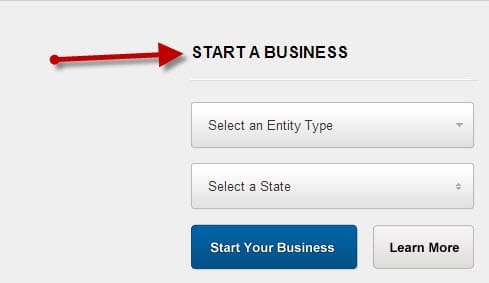 What if I don’t know which business entity I want to form? As it turns out, this “question” is actually the company’s strong point and I’ll explain that towards the end of the review. But they do offer a free start up consultation. If you click on that tab you can reach out to My Corporation and one of their representatives will call you back to help lead you through the process. The caveat is they don’t provide legal advice. Also the site has a wonderful chart that compares all the pros and cons of different types of business organizations. You get to that tab from the home page. 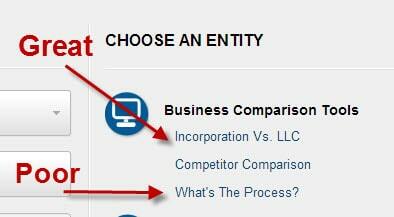 Under “Choose An Entity”, select “Incorporation Vs. LLC “.I thought that was very cool. So for people who are puzzled by which kind of business they should form, both of these tools might be useful. But not everything clicked. 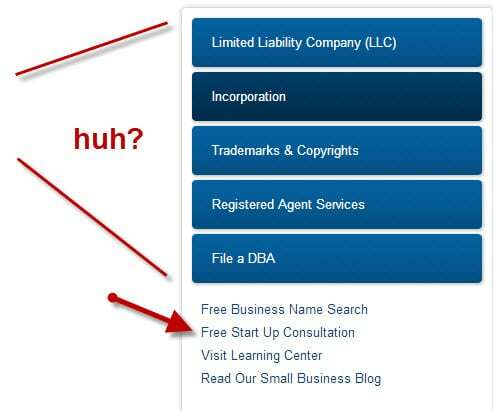 There is a link under “Incorporation Vs. LLC” link named “What’s the Process?” I would have really liked to have understood the process a little better but unfortunately, the video that came up explained why people should incorporate. Presumably, I’ve already been sold on that. If I click on a tab that says, “What’s the Process?” I want to learn about the process of getting my business formed. Sad Pilgrim. Setting up your company correctly is important. But if you don’t comply with ongoing requirements (called governance) you might as well not have set up your company in the first place. If you don’t stay up on your governance the courts could find that your business entity is null and void. Obviously, ongoing compliance is crucial. Fortunately, this is where MyCorporation shines. They will file just about any form you need on a one-time or ongoing basis. I was especially happy to see the “Corporate Minute Writer”. If you have a Corporation you are required to keep minutes and do so in a very specific way. This service does this for you easily and inexpensively. MyCorporation costs a fraction of what an attorney would charge. You can pay them $69 and they’ll do all the paperwork for just about any business formation. And for $99 they’ll do the ongoing compliance. That’s pretty darn cheap. When you compare MyCorporation to Legalzoom and Rocket Lawyer the prices are all comparable. But I don’t think price tells the entire story. Since these blokes focus entirely on small business, you get battle-tested professionals in the trench with you with MyCorporation. This is something the other companies can’t offer when it comes to small business. And the fact that a huge number of lawyers and CPAs use them for document preparation tells me that they do a professional job. I think for the right person, this company offers a huge value proposition. Before you use any online legal document preparation service, you should know exactly which kind of business entity you want to form. My strong recommendation is to get in front of a business lawyer for an hour or two and let them advise you. Don’t skimp on getting that advice on the front-end. Your decision on this will have huge repercussions for years to come. Choosing the right way to organize your business is absolutely essential. But once you have that professional advice, you can save a lot of money by using My Corporation to do the administrative stuff. Why pay an attorney hundreds of dollars per hour when you could get the same (or better) work done for a fraction of the cost? It just doesn’t make sense to forgo this savings amigo. In my discussion with MyCorporation’s CEO, I discovered that lawyers and CPAs make up a huge part of their clientele. What that means is that you are probably already using MyCorporation – it’s just that you don’t know it. So what’s happening now is that the attorney bills you $1000 to get a corporation filed. Then the attorney pays MyCorporation about $69 to do the work. I’m no math genius but to me that smells like an opportunity to save some sweet stacks. And that aroma is oh so nice. Sure…pay a few hundred for a consultation with Laura the Lawyer. But then use MyCorporation to file the documents. When I realized that the lawyers and tax pros are using MyCorporation for their clients, it was a no-brainer to me. By cutting out the middle-man, you can save serious bread. They operate in all 50 states. The turn your paperwork around in 48 hours. Unlike any other online doc prep firm, they have fantastic services to help you stay compliant inexpensively. For $99 a year they’ll do all your annual filings. That’s cheap – and a big rock lifted off your shoulders. I love the fact that the CEO of the company is accessible and excited about the business she’s in. This permeates the entire firm and it’s a huge benefit to users. Once you sign up you will have a dedicated professional assigned to you. She’ll answer your questions and lead you through the process from top to bottom. Muy Bueno. They specialize and only work with small business. I looked high and low for complaints and couldn’t find any serious problems but that didn’t surprise me. They are experts in small business filings. My guess is they do a better job at it than most attorneys do who only prepare business filings every now and then. There were two things that bothered me. First, I was confused by the link that was supposed to explain the process but did not. I brought this up to Deborah and I believe she’ll get that fixed. I also think they could do a better job of explaining that people should seek out professional guidance on which business form suits them best. To be fair, none of the online document preparation sites do this and I think it’s a shame. It would have been nice for Sweeney’s company to do that. Know what kind of business to create. Want to off-load and out-source the ongoing pain in the neck corporate governance. I created an S-Corp recently and I would absolutely have used Deborah’s company if I was to do again – after my attorney confirmed that this is the kind of business to open. If you are starting a business or have a business and want to keep it kosher without worrying about the paperwork, I recommend you consider using this company.